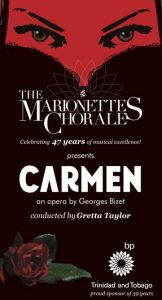 The Marionettes production of Bizet’s Carmen debuted at the Queen’s Hall earlier this month, to rave reviews and sold out audiences. Critics hailed the production as “one of the best theatre productions this year [with] masterful performances” (The Guardian); “entertaining and well done” (The Express); and “a truly wonderful evening of music” (The Newsday). 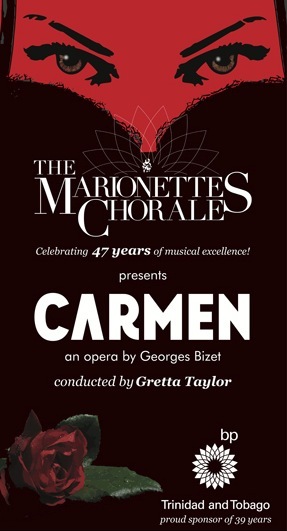 Here’s your chance to see it again, or get a taste of the Carmen experience for the first time! Cast: featuring Lesley Lewis-Alleyne in the title role as Carmen; Nigel Floyd as Don José; Arnold Phillip as Escamillo and Natalia Dopwell as Micaëla. They are supported by Nigel Pierre as Zuñiga; Garfield Washington as Moralès; Ayrice Wilson as Frasquita; Llettesha Sylvester as Mercédès; Stephan Hernandez as Dancaïro; Errol James as Remendado; Caroline Taylor and Dwight Lewis in the spoken roles of Lillas Pastia and the Guide. When: Emancipation Day (1st August in Trinidad & Tobago) at 8pm, possibly repeating on Independence Day (31st August), though this is unconfirmed. The recording is of Sunday 10th July. Where: C-TV can be found on Channel 6 (FLOW Cable); Channels 9 & 13 (Trinidad VHF); Channel 20 (Tobago UHF); and Channel 2 (Trico Cable, Tobago). It also operates a live stream on their website. Cast: The broadcast premiere, sponsored by the Marionettes’ corporate partners of 39 years bpTT, features the 150-strong opening weekend cast, featuring Candice Alcantara in the title role as Carmen; Marlon De Bique as Don José; Marvin Smith as Escamillo and Feryal Qudourah as Micaëla. They are supported by Richard Pierre as Zuñiga; Arnold Phillip as Moralès; Jacqueline Smith as Frasquita; Patrice Quammie as Mercédès; Kashif Dennis as Dancaïro; Raguel Gabriel as Remendado; Caroline Taylor and Dwight Lewis in the spoken roles of Lillas Pastia and the Guide. will be posted as we know them.